The search box on the library’s homepage (a.k.a. “Encore”) is not functioning properly. We’re working to get it fixed, but in the meantime you can search for books & DVDs using the “Classic Catalog“. To search for articles please start at either the Databases A-Z page or the Databases by Subject page. If you need help locating library items or conducting research, please stop by the Reference Desk, email refdesk@bentley.edu, call 781.891.2300 or contact us via IM/chat. We apologize for the inconvenience. The Bentley University Library is pleased to announce the launch of our new discovery service, Encore. Over the past few years, in both formal and informal settings, patrons have told us they wanted the ability to search topics from multiple resources, including the LIBCAT library catalog and articles from aggregated database vendors such as ProQuest and EBSCOHost, with one search interface. The Encore discovery service provides users with ability to do just that and to filter results with multiple facets. Over the coming months patrons will see the Encore search box appearing on Bentley Library webpages and online research guides. The Bentley Library Encore homepage can be accessed by pointing your browser to http://encore.bentley.edu. (The Encore search box also appears on our homepage at http://library.bentley.edu). Because Encore provides access to licensed electronic resources it is only available to current Bentley University students, faculty and staff. You will need your Bentley University Email Address and Network Password to login to Encore. To use Encore simply enter a search term in the search box and click the arrow. Use and “and”, “or” and “not” to expand or narrow a search. To limit a search to just those items in LIBCAT or the Library’s articles databases click on the “Articles” or “Catalog” (the default) options at the top of the page. 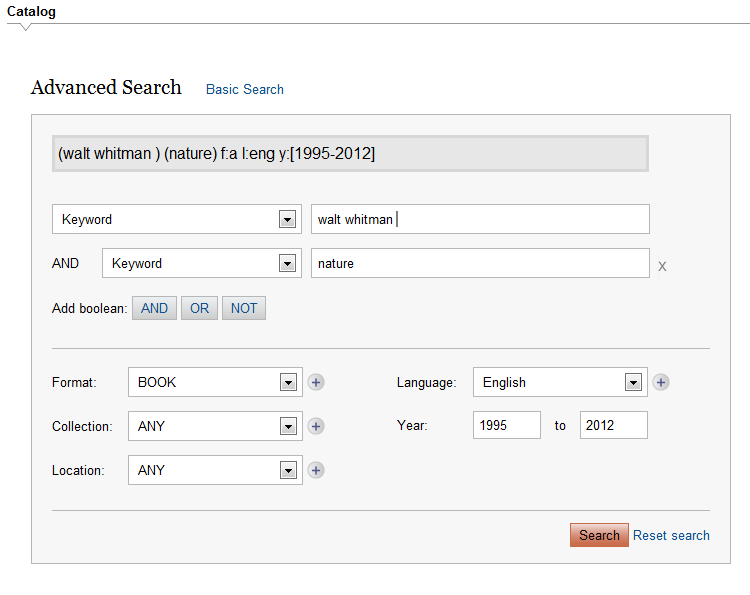 Encore provides an “Advanced Search” option that allows patrons to search using keyword, author, title, and subject indexes just like LIBCAT. Users can also limit their search by language, format (book, DVD, E-Resource, etc.) and date range. Once the search is completed it is now time to filter and organize the results. By default Encore will return results by relevance. If the search was completed using the “Catalog” option, items from LIBCAT will be listed first, followed by links to articles from aggregated databases vendors. 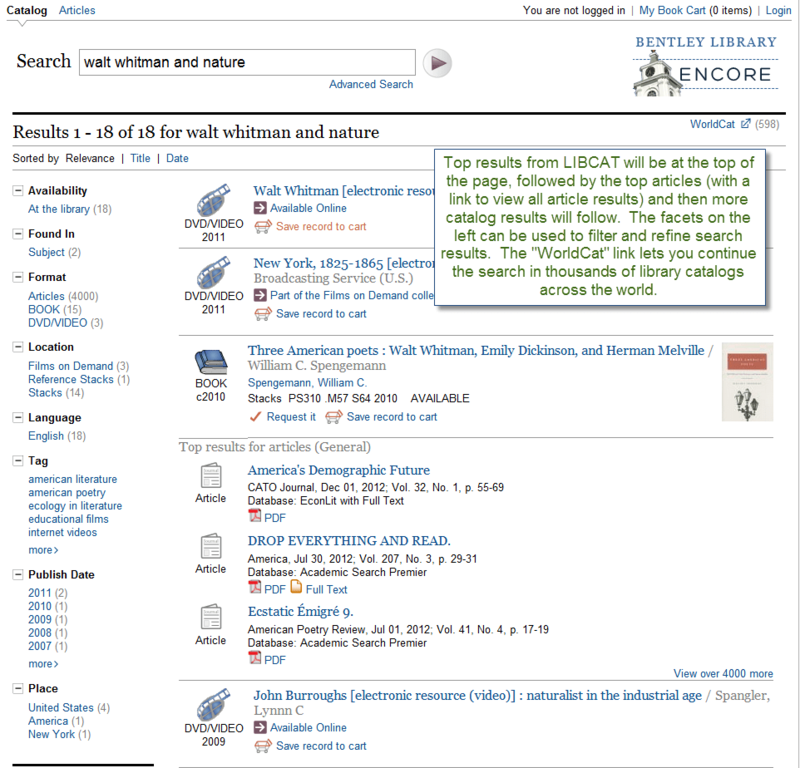 There is also a link to “WorldCat” on the results page, under Other Resources, that will search the WorldCat multi-library catalog for items not owned by the Bentley Library that may be available via Interlibrary Loan (see the “Database of the Month: WorldCat” post from April 17, 2012). Searches completed using the “Articles” option will only return results from databases. Users who wish to continue using the classic LIBCAT search interface can simply click on the link titled “Classic Catalog” or point your browser to http://libcat.bentley.edu. Encore does not search all of the Bentley University Library’s databases. It is designed to search articles databases from aggregated vendors such as EBSCO, ProQuest, JSTOR, Gale/InfoTrac, Project Muse, Elsevier, CQ Researcher, IEEE, and ACM Digital Library. The “Article” search will return by broad subject categories from those vendors indexed by Encore. For questions regarding Encore (or any library service) please contact the Bentley University Library Reference Desk at 781.891.2300 or refdesk@bentley.edu.